Enjoy total comfort, year-round savings and ultimate efficiency without the costly ductwork with a ductless HVAC system. Ductless systems, also known as mini-split systems provide flexible, energy-efficient heating and cooling. Unlike traditional central air conditioning systems that rely on ductwork to carry air to vents to cool your home, ductless systems are duct-free. They are comprised of an outdoor unit and one or more ductless “heads” to provide zoned heating & cooling in your home. They can be used as a whole home solution or to add heating / cooling to a specific room or addition. Individual Room Controls – Use only the exact amount of energy you need to perfectly heat or cool and area and maximize savings. Flexible Applications- Wall mounted, floor mounted and ceiling recessed units allow you the flexibility to maintain the integrity and style of your home. Ultimate Energy Efficiency – With ratings as high as 32 SEER and 14 HSPF you can reduce utility bills by up to 25%! Less Invasive Installations – Without the need for traditional ductwork, installation is less invasive and required less major construction. This is particularly beneficial if you have an older home lacking the space for traditional ducts. Whisper Quiet – Unlike traditional systems, ductless systems are whisper quiet so you won’t even hear it running. Ductless for homes with no existing ductwork – Sick of cooling your home with window units? One of the most common applications for ductless systems is to provide air conditioning to homes with no previous ductwork. Installation is less invasive, and systems can be configured to provide individual room controls for ultimate flexibility and efficiency. Ductless for older homes – Ductless is an affordable, non-invasive and energy saving choice to add or update HVAC to an older home. No room for ducts? Old plaster walls? No worries! The small footprint of a ductless system allows you to modernize your whole while keeping the architectural integrity intact. Ductless for additions & remodels – Ductless doesn’t have to be a whole house system. Sometimes you just need to easily heat or cool an additional space like the attic, basement, sunroom or a new addition. Ductless systems offer endless customizability for each unique home. Want to learn more about ductless technology or if a ductless HVAC system is the right choice for you and your family? 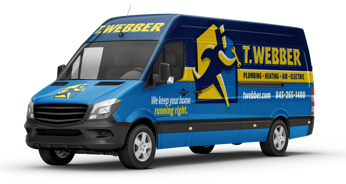 Call T.Webber today. We offer free onsite consultations to walk you through the best HVAC solutions for your home. Our team of HVAC Experts proudly serves the entire Hudson Valley, including: Dutchess, Putnam, Westchester, Orange, Ulster & Rockland County.